Description: Stoloniferous or sometimes rhizomatous perennial to c. 0.8 m high; culms decumbent, 0.5–1.5 mm wide, glabrous to scabrous, 3–5-noded. Leaves with sheath slightly scabrous to scabrous, deeply ribbed; ligule acute to long-acute, 6.5–12 mm long; blade 2–4.5 mm wide, scabrous, moderately to deeply ribbed. Panicle erect, contracted, incompletely exserted, to 35 cm long. Spikelets 9–15 mm long with usually 6–10 florets. 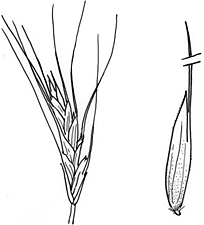 Glumes unequal, with broad membranous margins, glabrous; lower 1–3-nerved, upper 3–5-nerved. Lemmas scabrous to hispid, 3.7–5.0 mm long, 5–7-nerved; apex 2-toothed; awn arising 40–60% of the length of the lemma length from the tip (adhering for the first 1 mm), straight, not twisted (or scarcely so). Palea 30–75% the length of the lemma, smooth. Distribution and occurrence: Grows mostly in permanent swamps; uncommon.